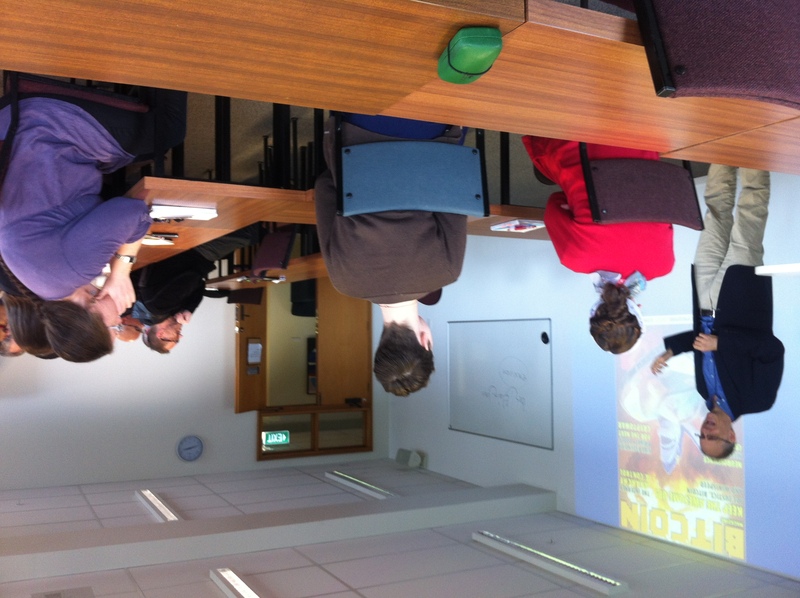 We were delighted to welcome Professor Eric Meyer back to the University of Canterbury for a brief visit over the past two days. Eric previously visited the UC Digital Humanities programme as a Visiting Canterbury Fellow in 2014, and was back in New Zealand to speak at the National Digital Forum in Wellington earlier this week. 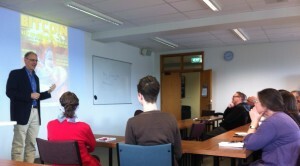 He very kindly added a Christchurch leg to his trip, so we were able to hear him speak yesterday about work arising from his book Knowledge Machines (with Ralph Schroeder, published in 2015 by The MIT Press), then this morning we attended his workshop entitled “Metrics and Measurement: The Impacts of Digital Resources and Collections”. The workshop stimulated some broad ranging discussion that moved from ways of measuring impact into exploration of data collection tools and methods of data analysis in various fields of research. A number of our Media & Communications postgrads took the opportunity to ask Eric about possibilities and limitations of using social media data, which led to some interesting debate. Thank you, Eric & Michelle, for making the trip down to see us in Christchurch – we wish you safe travels for the journey home. And thanks National Digital Forum for inviting Eric to speak and getting him over to our part of the world! Our next upcoming seminar will describe two Omeka projects, developed by the Art History Department and supported by Digital Humanities. 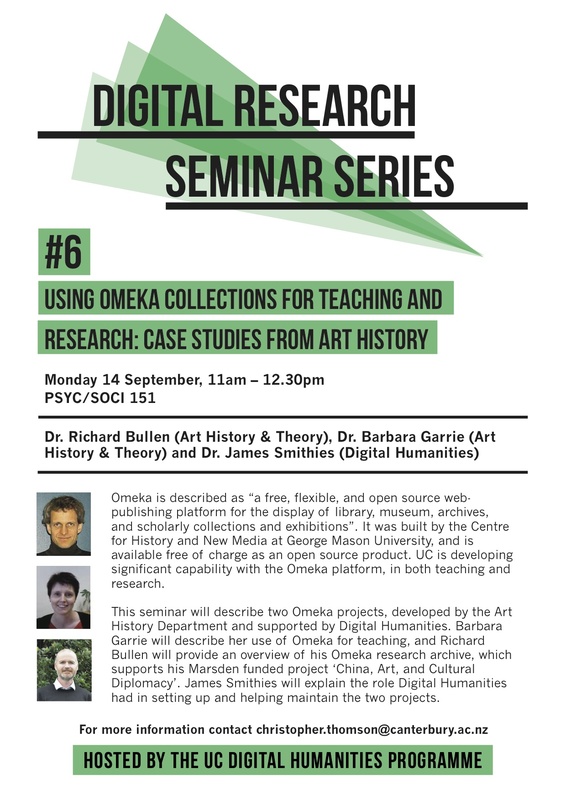 Barbara Garrie will describe her use of Omeka for teaching, and Richard Bullen will provide an overview of his Omeka research archive, which supports his Marsden funded project ‘China, Art, and Cultural Diplomacy’. 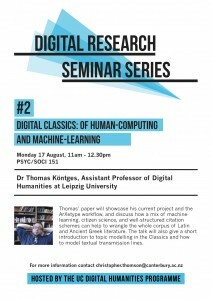 James Smithies will explain the role Digital Humanities had in setting up and helping maintain the two projects. 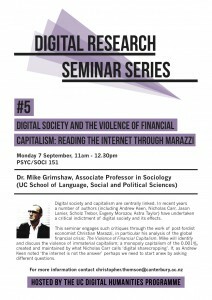 At next week’s seminar (Monday 7 September, 11am in Psyc/Soci 151), Assoc. 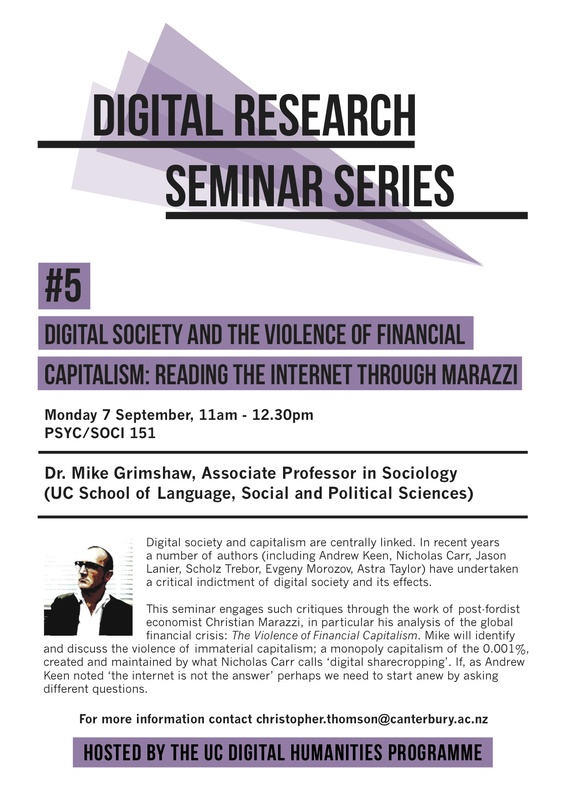 Professor Mike Grimshaw (UC Sociology) will discuss the linkages between digital society and capitalism, engaging with contemporary commentators and, in particular, the work of post-fordist economist Christian Marazzi. See the poster for further details. 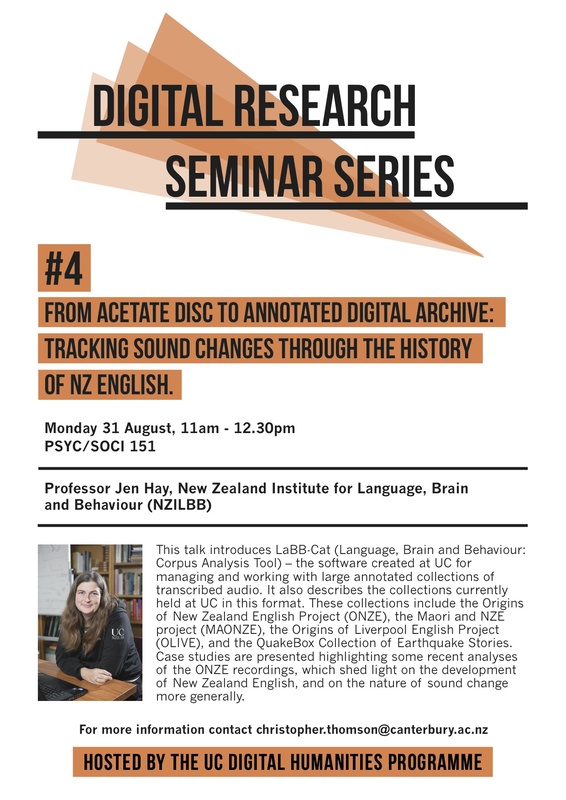 We are delighted to announce that at our next seminar Professor Jen Hay (New Zealand Institute for Language, Brain and Behavior), winner of the 2015 University of Canterbury Research Medal, will give a talk about the LaBB-Cat software created at UC for managing and researching large annotated collections of transcribed audio. As usual, the talk is on Monday (31st August) in Psyc/Soci 151 at 11am – 12.30pm. Next week’s seminar is in two parts. 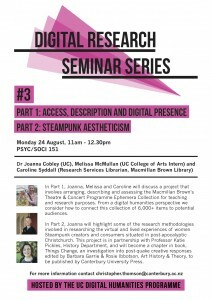 In part one, Dr Joanna Cobley (History, UC), Caroline Sydall (Macmillan Brown Library), and Melissa McMullan (UC Arts Intern) outline a project to arrange, describe and assess the Macmillan Brown Library’s Theatre & Concert Programme Ephemera Collection. 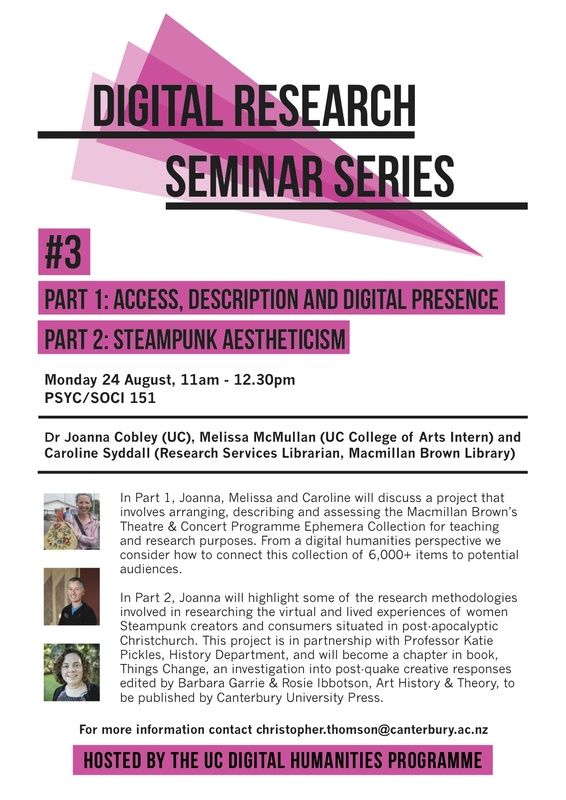 In part two, Joanna will describe her current project investigating the virtual and lived experiences of women Steampunk creators and consumers situated in post-apocalyptic Christchurch. 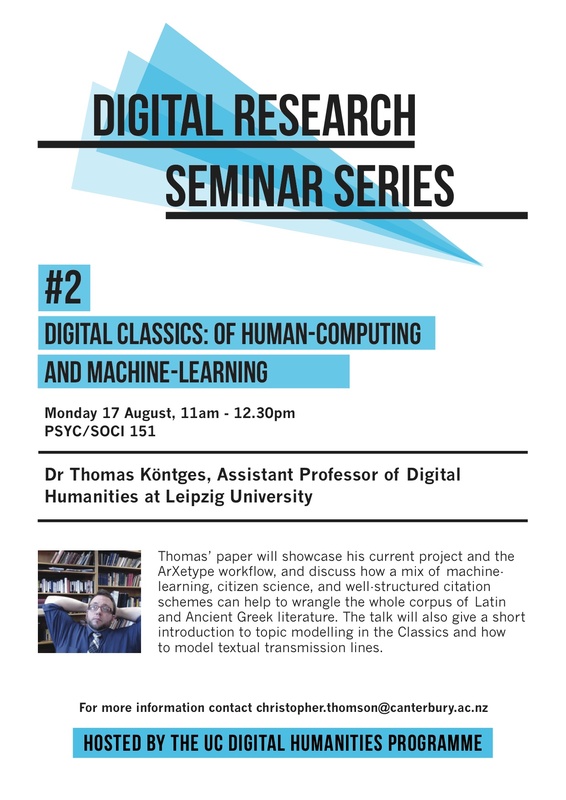 For our second seminar, Dr Thomas Köentges, Assistant Professor of Digital Humanities at Leipzig University will present a paper on his current project, ArXetype, which employs a combination of machine learning and citizen science to digitise and better understand the entire corpus of Latin and Ancient Greek literature. 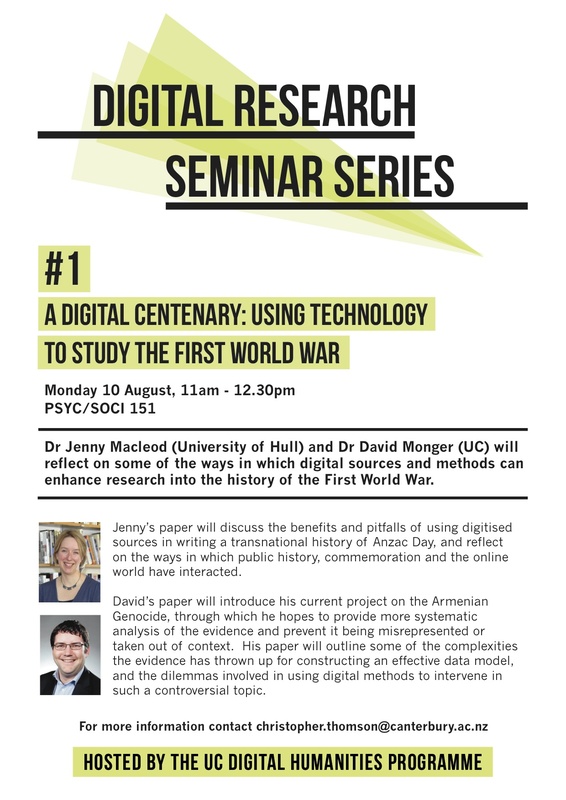 The first seminar in the 2015 Digital Research Seminar Series will be given by Dr Jenny Macleod (University of Hull) and Dr David Monger (University of Canterbury). 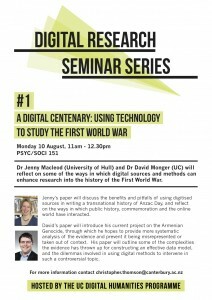 They will reflect on some of the ways in which digital sources and methods can enhance research into the history of the First World War.